I love salads. I love the many ways they can be served up with little fuss. 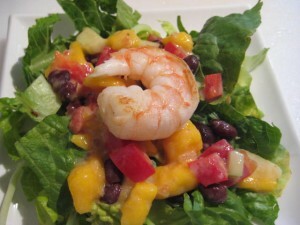 You can make salad your entire course or use as a first or last course with dinner. There are so many salad greens to pick from when preparing a salad. Arugula, red leaf, romaine, iceburg, radicchio, endive, bib, Boston… the list goes on. Since lettuce has little caloric value you can dress it up with all kinds of goodies that are slightly higher in calories. Add chicken, tuna, shrimp, ground beef, or crab. There all types of fruits that can be used from apples to mangoes. Oh, and let’s not forget slaw salads. The best part is that salads take little time to make and are another avenue for adding variety to a meal. So what is the top lettuce variety that offers the best nutritional value, most fiber and least amount of sugar? It’s romaine lettuce with green leaf lettuce being the runner up. The darker green lettuce types are the healthiest. Adding a salad to your daily diet will help keep your calorie intake in check while providing your body with important dietary fiber and nutrients.